I hope by now you guys have found the "Sikk Bike"
Well at $700 plus mods I just plain said NO! The group I race with has its share of talented builders. One in particular had an idea. 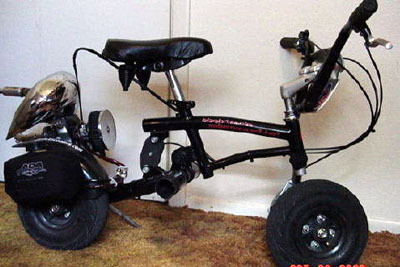 The pictures are the result... Its half Big Foot (GoPed) half little kids Runt peddle bike. The two get welded together in a marriage of what becomes a mini crotch rocket. Parts are plentiful because its power source is Big Foot. Currently I am running a Zenoah G230 RC 22.5 cc engine with an Engine Trix expansion pipe. Drive is via a simple spindle to tire, with cable actuated motor raising and lowering. 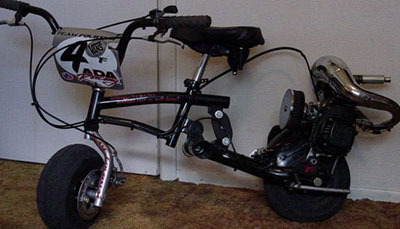 Wheels are standard plastic issue from Go Ped. Strength is not an issue, (no jumping is done with this bike). Tires are treaded racing minis. At this time we have a recorded top speed of 30 mph on radar.